Hello and welcome to Friday. The day of reckoning draws ever closer. By 6pm Sunday we’ll know what next season will bring in terms of European football, but it strikes me that what we need to do this summer won’t be too heavily influenced by where we end up. Accepting that Champions League football is a draw for certain players, it doesn’t mean you can’t sign quality just because you finish outside the top four. Clearly Luis Suarez is a crazy man but he’s also a rather wonderful player. The Mugsmashers managed to sign him despite scoffing from Europe’s lesser plate and have never given him a moment of Champions League football. The reality is that our summer business should be predicated on the massive points gap between us and the title winners, not the very small one that will exist between us and 4th if things don’t go our way on Sunday. Maybe it’ll make it a bit more difficult to do the business we want but we’ll have nobody to blame but ourselves for that. Perhaps better investment last summer, or even a January booster, might have made this Sunday irrelevant, so little changes either way for me. If we do what we need to, and win the game, it’s not as if you can mark the season down as a success. We’ll have achieved the minimum required, no more, no less. It’s not a laurel to be resting on in any way. We can be encouraged by what we’ve done in the last few weeks, and how we’ve done it, but it doesn’t alter the fact that this squad needs to be more competitive in all competitions. Obviously the ideal situation is to win our game, see what happens in the others, and then make our plans based around that, but hopefully the word ‘contingency’ has been bandied about a bit because it would be unwise not to think it couldn’t happen to us. Still, three points makes all of those concerns subside, but between now and Sunday it’s hard not to worry. Honestly, his chances of being available are minimal. I have to be realistic and prepare for another solution. He is an option, yes. We will monitor him until Sunday and I will make a decision very late over what I will do. 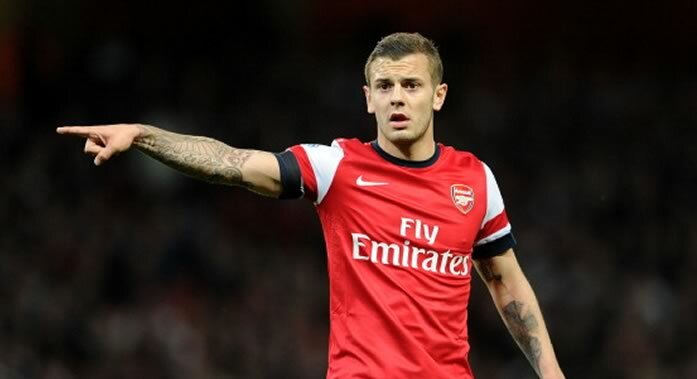 To me Wilshere is the only realistic option provided he’s fit enough. We know he’s scheduled for post-season surgery on his ankle, the risk is whether or not he might cause himself some real damage. I suspect, given that he was about to come on just before Theo Walcott’s goal on Tuesday, that he’ll probably be all right. The boss said he’d only use Jack in an emergency and, well, this comes pretty close. It’s not run around and wave your arms in the air screaming territory, but missing the experience and calm of Arteta for such an important game is hardly ideal. Ramsey and Wilshere at the base of a midfield with Rosicky at the top is about the best we could put out. There’s no Diaby, as we know. Francis Coquelin is a tidy player but he hasn’t started a game since the FA Cup defeat to Blackburn in February and his last appearance was a brief cameo as we held on against West Brom at the start of last month. That leaves Jack, and although there are doubts over his fitness, I think we’ll be able to get something close to 90 minutes out of him. I suppose the other option is to deploy Ramsey in the Arteta role, move Rosicky back into the middle, play Santi as the most forward midfielder and play somebody else wide (perhaps Podolski with Giroud coming back as the main striker), but I’d worry that we might be a bit lightweight in there and we’ll have used up all our attacking eggs in one basket. The Podolski/Giroud decision is another one that isn’t obvious either. After two games where he struggled, the German scored twice on Tuesday and it’d be difficult for the manager to drop him after that. Yet Giroud, for me, is a much more rounded centre-forward who holds the ball up well and will be nice and fresh after his three game ban. No doubt we’ll get more from Arsene in today’s press conference on the various permutations. Right then, onto this week’s Arsecast and I’m joined all the way from the USA, and from Stan Kroenke’s home town no less, by Paolo Bandini. On the agenda is the Wigan game, how we cope with the absence of Arteta, the looming Newcastle game and all the other bits and pieces that have gone on this week. Also in there, some sports goods advertising while Mick Bendtner and Arshavin do a duet. You can subscribe to the Arsecast on iTunes by clicking here. Or if you want to subscribe directly to the feed URL you can do so too (this is a much better way to do it as you don’t experience the delays from iTunes). To download this week’s Arsecast directly – click here 22mb MP3) or you can listen directly below without leaving this very page. If you fancy a look at the book Paolo mentions, this link is your friend, and remember, the Arsecast can be found on Soundcloud (where you can subscribe/follow) as well as in their apps. And that’s about that for this morning. We’ll have all the news from the press conference over on Arseblog News, and I’ll be back here tomorrow as usual.